"In the hell of War there is only one pleasure left to men ... Ursula Andress ... Once before I die!" Absolutely. Here are the next five posters. More than fabulous Joe. i'm listening on line to Film scores of the Fifties now and its a perfect sight and sound harmony. Not keen on the One Spy too Many. Illustration-looks quite amateur really. 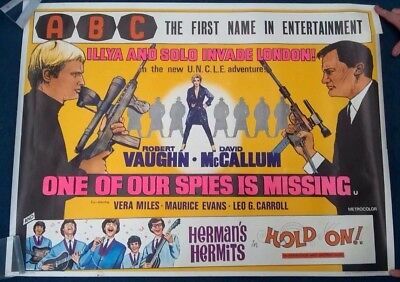 Thanks again for more great posters - the OSS 117 posters are fairly unusual, and there is a chance to do a decent exhibition of sixties spy film posters, looking at just the O's- they do seem to be a particular style. Rick C - is that a streaming site? There are a fair number of film track sites that I have found, and there are some unexpected finds, but I'm always interested in finding another. Bonekicker- that was a bit of a typo. It was film scores generally from the 50s at the time, Classic FM have a film score spot every Saturday evening. Otherwise, have you tried Film Score Monthly-the internet version of the periodical? Keep those posters coming, Joe. The artwork and energy in those posters is phenomenal. Most of today's just have close ups of the main players and are so dull in comparison..
Another set of wonderful posters Joe, thanks for sharing the pleasures of the paper. This time we were lucky to see several of those "spy" movie posters. The U.N.C.L.E. one had some rubbish drawing (perhaps it was traced from a photograph by the office junior), but I'm hooked on the terrific forced perspective used for James Coburn's legs in Our Man Flint. We know he's tall, but here he is , like, LEGendary Lanky Tall. This, and the Bond posters, must be why for many years after ... a poster isn't a poster unless someone is holding a gun. I remember walking around Blockbuster trying to find a VHS cover that didn't have one of the lead actors holding a gun, it just became a treasure hunt. Try that U.N.C.L.E. in colour! Fantastic Joe. Thank you for sharing your fabulous collection. Interesting to see the poster for Oklahoma Woman where Touch Connors is named as a co star. Touch became Mike Connors who went on to become TV detective Mannix. Thank you to everyone for your kind comments regarding my recent quad poster uploads for the letter O. I am really happy that you are all enjoying the film poster collection. I will be uploading more in the next few weeks. Thanks for uploading this great collection. Really informative. Glad to have found it mid way through the upload so I could gorge on A - O. The Archive staged several spy movie poster exhibitions around the country in recent years.